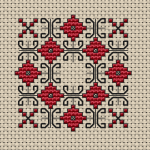 Small geometric design of a red stylized flower,polygonal red frame and black background. 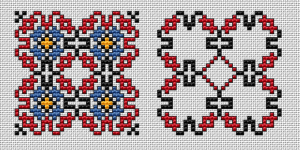 A monochrome cross stitch pattern for those who like backstitch. Suitable for biscornu making and other craft projects. 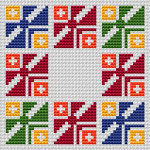 A colorful geometric cross stitch pattern.Suitable for biscornu making,borders,frames,covers and other projects. 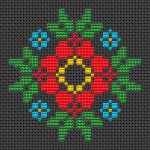 Cross stitch pattern of a biscornu with four colors (face and back side), using a Bulgarian embroidery motif. It can also be used for making cards and other small ethnic souvenirs. 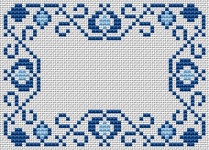 The pattern is for tablecloth and based on traditional Bulgarian embroidery. 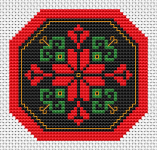 Small motif in red and black suitable for biscornu making.Use 1 and 2 strand of thread for the backstitches. 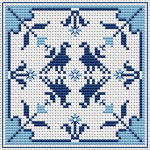 Blue biscornu pattern with abstract flowers and birds. Small design with red and blue abstract flowers for 14 count black fabric. 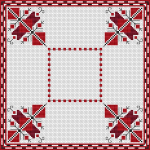 An abstract cross stitch design resembling fabric patterns.Contains only full stitches. 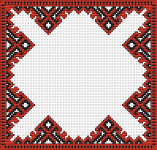 Traditional Bulgarian embroidery in red colors with a border in red and black. An idea for a bookmark after popular Confucius quote:"You cannot open a book without learning something".